The next time you’re on a Cathay Pacific or Cathay Dragon flight, you might want to bring along some wet naps. This week, the South China Morning Post reported the airlines have cut back on their cabin cleaning schedules, lengthening the interval between deep cleanings from 14 days to every three to four weeks. While the airlines confirmed that a reduced cleaning schedule had been implemented, a representative denied the change had anything to do with cutting costs, insisting instead that last-minute maintenance and routing changes had caused issues with the previous cleaning routine. Cathay Pacific’s 777-300ER economy cabin seats. Cathay’s new schedule may seem stingy, but it’s in line with other airlines. As of last year, Lufthansa’s cleaning schedule stipulated a deep clean after every 500 hours of flying, and both Singapore Airlines and Hong Kong Airlines deep clean their planes approximately once a month. Still, anecdotal evidence from the Morning Post demonstrated a dirty business seat on a flight to Bali and complaints from a regular (though unnamed) premium Cathay passenger. Unlike the quick cleanup routinely performed on an airplane between flights, a deep cleaning takes several hours and includes cleaning and disinfecting seat cushions along with many other elements of the interior cabin, such as seat frames, seat backs, tray tables, windows, accessories and the surrounding area. A 2014 study by researchers at Auburn University found that bacteria could last up to a week inside an airplane cabin and emphasized the importance of cleaning planes regularly. The two-year study showed that E. coli and MRSA bacteria survived up to 168 hours on material from the seat-back pocket and armrests. 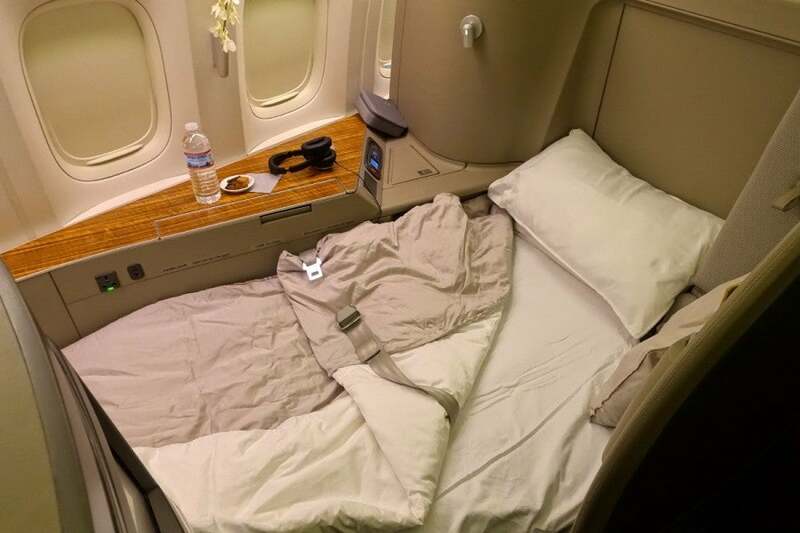 Cathay Pacific’s first-class bed with bedding. Cathay Pacific is a popular choice amongst points and miles aficionados thanks to its fantastic first class trappings — TPG’s Editor in Chief wrote in his review of a 15-hour flight in the cabin last year that he “truly didn’t want it to end.” However, our reviewers have also generally been impressed with Cathay’s economy cabin offerings as well. Cathay disputed that the change in schedule was creating any new cleaning issues, but a spokeswoman told the Morning Post that the airlines planned “to increase the number of cleaning hours” in cabins. H/T: Phillip T. via Twitter. Featured image courtesy of Richard Baker via Getty Images.